Normalize Your High Blood Pressure Instantly, Like Magic! High blood pressure is often a major problem if you are in middle age. If you don't pay attention to it, it may lead to serious complications later on such as heart failure, stroke, and even death. Is your high blood pressure out of control? If so, it's likely that even your doctor's prescription for hypertension may not work at all. Of course, the super prescriptions that I'm about to give you may not work for you, but we have approximately 80% of high blood patients who benefited from it. Some of them experienced good results in just a few days. Most are in just a few weeks. Nevertheless, you need not to wait for even a month. Wow! It is not really a bad idea to take medicines prescribed by your doctors. The problem is, you are somewhat hesitating to take the prescriptions because these are not working at all. What's wrong? You may also think of getting a single drip of viper venom. It is known that venom of a viper can lower blood pressure instantly. Yes, it is true that many scientists are trying to study about it, too. Diuretics are good in lowering high blood pressure, too. And it sounds better than any other techniques since it does not have any serious side effects so far. The diuretic process works by inhibiting sodium reabsorption in the kidney, which will reduce the salt buildup in the body. This process does not mean that all high blood patients can benefit from it. It may not work if you have poor kidney function, or if you have an advanced arteriosclerosis. But do you believe that about 60-70% of people can benefit from it according to the data collected. Well, why don't you try it? There's nothing for you to lose. What are the major minerals that work in reducing sodium in the body? Potassium, calcium and magnesium were among the answers that I gathered. Kelps, bitter melon, papaya, sponge gourd (loofah), and mugwort, are some of the good foods. Do you have stubborn stiff neck and shoulders? Were you told by your doctors that your stiff neck and shoulders is caused by high blood pressure? If you are lucky, your stiff neck and shoulders will go away just like magic right now! Are you having trouble in finding the cause of your stubborn stiff neck and shoulders? If so, try lifting up your shoulders for a while just like the illustration below. How do you feel? Do you feel good? How about your stiff neck? By means of the above movement, you will be able to understand if your stubborn stiff neck can be removed instantly or not. 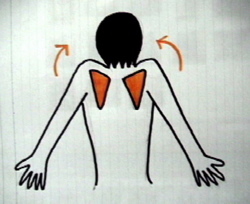 Stretching your shoulder moves the collarbone (clavicle) upwards. If you feel pain, then it means that you might be affected with “Thoracic outlet syndrome”. 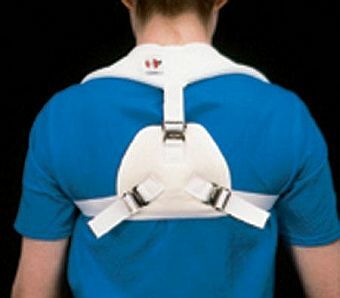 Treatment may be simple and can be done by using a clavicle brace, similar to the photos below. 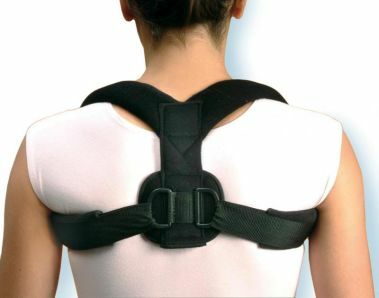 Upon wearing a clavicle splint or brace, you may not feel any stiffness anymore from the moment you lift up your shoulders, as the use of clavicle brace helps to rest and stabilize the bone. 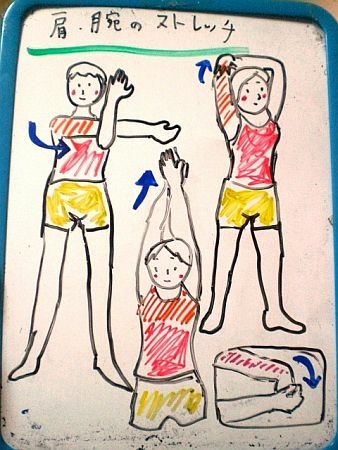 We also recommend you to do a simple exercise of stretching arms just like the above illustration to help strengthen the muscles around the collarbone.